When the Autos were on strike from past Friday the worst affected had been the school going children who take an auto to get to school. As per estimates almost 25-30% of the students in a school make use of autos to reach their school and then back home as not many schools have their own school buses. Many Good Samaritans who were on their way to leave their kids to school or to work were seen ferrying students to school and even back home. 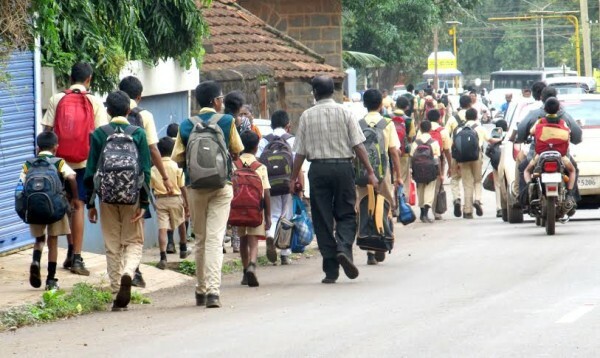 Not each family has someone to ferry the kids and get them back according to their timings and hence many children preferred to walk it out to school even as far as 3-5 kms. We met one child from a school in camp who lives with his grand parents and with the auto strike he walked all the way from his house to school a distance of 3 kms. His father is in Delhi for a job and his mother is no more staying with them, it was the grandparents who look after him. But recently the grandmother is severely ill and the grandfather has to sit beside her all the time to take care of her and due to this the little fellow of Std.1 walked all the way to school where at Globe theater his classmates father ferried him to school. It is also not very safe to take a lift from an unkown person, but the kids were seen telling their parents he/she is my classmate and then the parent used to ferry them to the school. Even I had to carry my neighbour's kids while returning…..